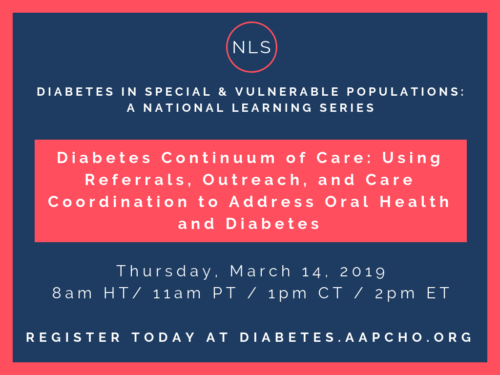 This webinar will kick off a national learning series of four webinars titled, Diabetes in Special & Vulnerable Populations: A National Learning Series, on effective strategies to prevent, treat, and manage diabetes among special and vulnerable health center program patients. To describe why accessing oral health care for patients with diabetes is both essential and difficult. To identify the roles and responsibilities integral to a patient-centered, multi-disciplinary care team. To describe the function of outreach workers in care coordination and on a care team.